Do you spend way too much time in the kitchen, yet your cooking is going unappreciated? You can turn those remarks into a rewarding one with the help of Pigeon pressure cooker. These are extremely efficient kitchen appliance catering to your needs. 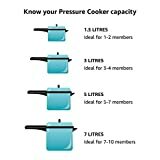 A pressure cooker is not merely used for making steamed rice. You can make a variety of rice preparations like pulao, lemon rice and biryani. You can also braise meat, cook stew all packed with protein and flavor. Superior quality of aluminium is used to make the body of the pressure cooker. The rubber used in the lid is tough and of better value. Proper grip is provided keeping the safety issue in consideration. Some models are available both for gas and induction use. Warranty of 5 years is provided for almost all the models. The features might vary according to different Pigeon pressure cooker price ranges. 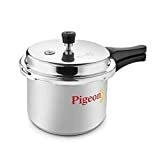 Pigeon pressure cooker has been in the market for long enough to create a mark based on its quality. The customers have been very satisfied with the consistency of quality and durability they have maintained.